My "Sandcastles" Collection is yet another in this series! 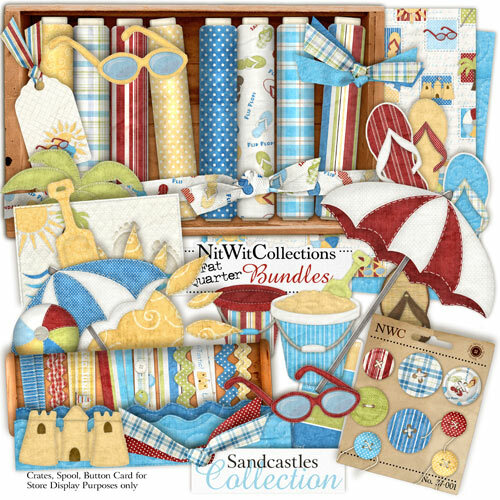 So I'm guessing you can tell that the beach and all things beachy were a huge inspiration for this kit, hey? Oh heavens I hope so or I'm not a very good designer, hey? hahahaha Yup... this ones all about the sand, surf, and the sun! It's full of colorful beach accessories! Umbrellas, sunglasses, palm trees, and flip flops to keep your feet cool from the sand! Hope this one takes you to the beach with me! Ooooh pass me a fruity drink, okay?